The universe overheard me say: ‘Everything is falling into place like we planned.’ Or maybe it just heard me think it. Either way, it heard me and it laughed…and laughed, and laughed. No offense to the Americans out there, but when I compare the US and Canada, I don't usually find myself admiring the good ol' U.S. of A. When it comes to radon, however, you've got us beat. We have radon readings that the EPA (U.S.) would consider a problem, especially with an infant in the house. But the Canadian guideline considers these levels acceptable. Our housing agency will do nothing because “then we’d have to fix all the other houses with levels like yours [and why would we do that when the government says we don’t have to?]”. It’s looking more and more like we’ll be moving. I have come to terms with this (almost). It looks like we’ll be able to afford a better place than we thought, so I might even be getting (cautiously) excited about it. All I could think was: Yes. Thank you, universe. You can stop rubbing it in now. 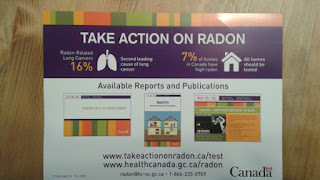 Most everyone I know, including myself, have a radon removing system in their basement. Is that not a possibility for you? I remember the cost being maybe $3k.